The Republic of Palau, an island nation North of Australia, just announced that it will ban all sunscreens that contain any of ten toxic ingredients by 2020. 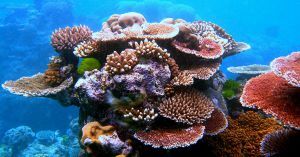 The new law, which will hit violating retailers with thousand-dollar fines, comes as part of a push to slow, prevent, and reverse coral bleaching in the area, according to BBC News. Palau joins Hawai’i among governments that have banned the toxic substances, perhaps the most harmful of which is a common sunscreen component called oxybenzone, repeatedly shown to kill off coral in controlled experiments. Just like plastic straws make up a minuscule fraction of the plastic found in the oceans, evidence suggests that sunscreen is responsible for just a small portion of coral bleaching. The real culprits, as the BBC reported, are climate change and algal blooms caused by agricultural runoff. But like banning plastic straws, putting the kaibosh on sunscreens with oxybenzone and other harmful chemicals is an obvious choice. That’s especially the case given that several coral reef-safe types of sunscreen hit the markets in response to Hawai’i’s ban. Though major pharmaceutical corporations like L’Oreal and Johnson & Johnson are fighting the ban according to BBC, switching to a safer alternative should not at all get in the way of tourists traveling to Palau.